In June 2010, after a year of solid work, I had a publishable draft of Wikicrazia. But send it to press I did not: rather, I uploaded it here on the blog and invited comments and suggestions. I received almost two hundred of very high quality comments, coming from tens of, well, Wikicrats; they helped me immensely improve the final result, which did go to press. Check out the Hall of Fame! If you wish to participate, there’s still much you can do. The June 2010 draft is still online, and it will remain so, together with all the comments. It is like the source code for the finished book (access it here; also available as a downloadable PDF. You can add your own comments, with my thanks. In fact, you could even use this source code to write your own version of Wikicrazia (and if you do it let me know, I’m really interested in reading it!). Here is the original June 2010 page in which I explain the rules of this game, that was to turn into a wonderful experience. 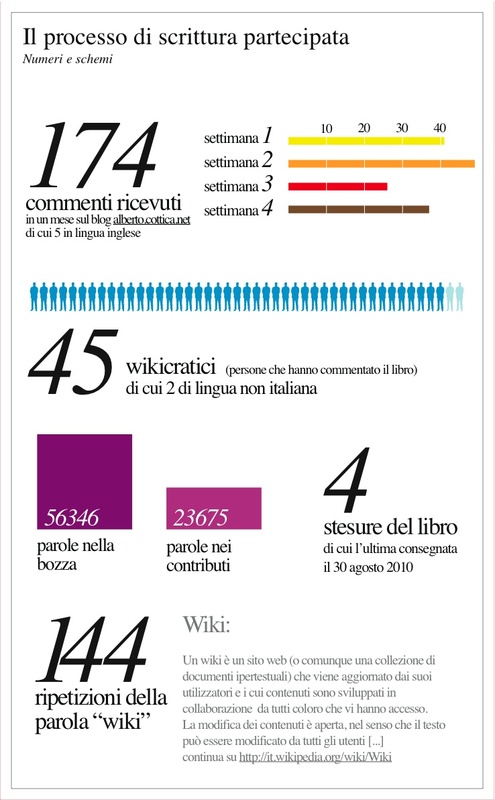 Do you wish Wikicrazia were available in your own language? Here’s my proposal: you and I can co-author a version fully customized for your language AND your institutional setting, with local examples. Write to me if you want to do this: alberto[at]cottica[dot]net. 2. Edgeryders va bene, anche se è un progetto molto ambizioso, spero di non avere osato troppo. Perché non provi a usarlo un po’, così vedi da vicino un altro esempio di processo decisionale? 3. Alicante funzionerà benissimo finché il direttore della scuola di dottorato sarà Giovanni Ponti, che è un ottimo economista e un ottimo didatta.